Figure 4-8. 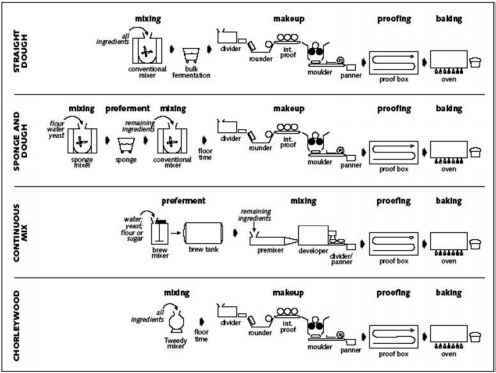 Traditional and modern manufacturing process for kefir. Otles and Cagindi. 2003. 22°C. Kefir grains are generally not used in the United States; instead, the milk is inoculated with a kefir starter culture containing Lactobacillus kefiranofaciens and Lactobacillus kefir. The mixture is incubated for sixteen to twenty-four hours or until a pH of 4.2 to 4.6 is reached. The coagulum is then gently stirred, flavoring ingredients (usually fruit) are added, and the product is then dispensed. Kefir should contain 0.8% to 1.0% lactic acid along with other heterofermentative end-products (acetic acid, ethanol, and CO2). Acetaldehyde and diacetyl are also usually formed.The kefir will have a tart flavor and a smooth, viscous body. Production of CO2 by the starter culture also provides effervescence and mouth feel.